Excess moisture, introduced through unsealed, vented crawlspaces, contributes to wood rot, fungi growth and increased pest activity. These conditions encourage infestation and colonization. Moisture in crawlspaces migrates to the upper levels of the home through a “stack effect”. As much as 50% of the air in a home’s living space originates from the crawlspace. The Andrews Tru Crawl Encapsulation protects homes from both the humid outside air and the ground’s natural moisture. Encapsulation minimizes fungi and mildew growth, encouraging a more structurally sound and healthier home. 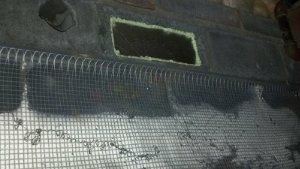 The first step to encapsulating a crawlspace is to stop the penetration of outside air by sealing all openings in the sidewalls, including vents and doors leading to the exterior. Next, the foundation and floor are lined with the Tru Crawl reinforced polyethylene liner to prevent moisture from seeping into the crawlspace. 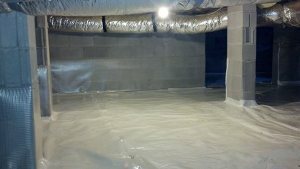 The premium grade 10 mil vapor barrier is specifically designed to effectively block moisture and withstand the ground’s natural alkaline qualities. 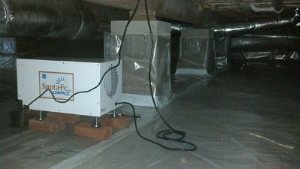 Lastly, we install an industry leading Santa Fe dehumidifier that is specifically designed to operate in a crawlspace. Removing excess humidity make the crawlspace inhospitable for fungi, dust mites, wood destroying organisms, and other pests. Some customers may choose to add a moisture monitoring system or a sump pump to their Tru Crawl encapsulation. 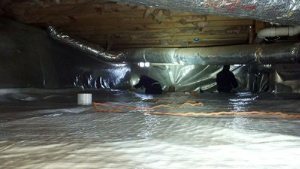 Questions about our Crawlspace Encapsulation services?